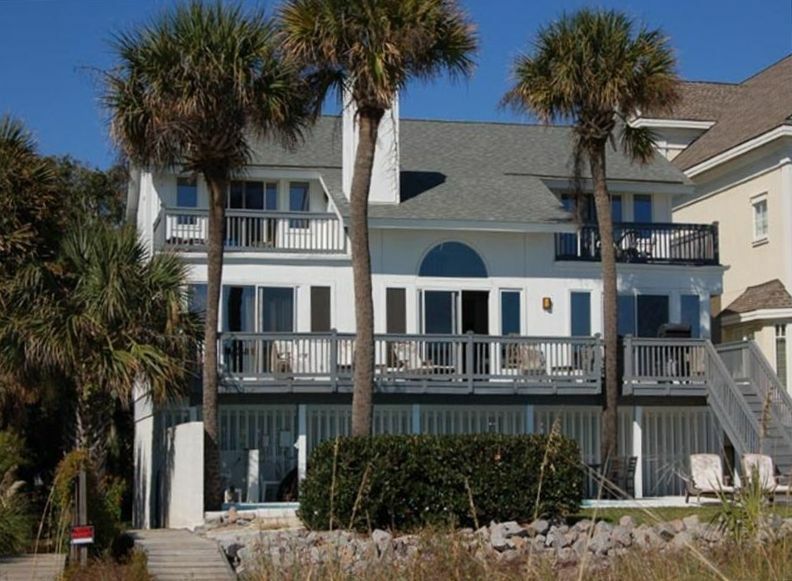 This luxurious, three-bedroom, direct oceanfront home is located on a private, oceanfront lot in the Northern most section of North Forest Beach on Hilton Head Island. This is a low-traffic area, which will afford peace and quiet in a tranquil setting. You are also just minutes from shopping, world-class tennis and golf, and casual and gourmet dining. Additionally, you are in walking distance of the world-renown Crown Plaza Hotel located in the Shipyard Plantation. The home comfortably sleeps eight to ten, offers direct ocean views from most rooms and has an ocean-side pool and deck for your private use. The living room has cathedral ceilings, fireplace, and large picture windows offering direct ocean views. The dining area seats six and there is additional seating for five at the eat-in kitchen bar which overlooks the dining and living areas. The downstairs master bedroom has a king-size bed with a private bath with Jacuzzi tub. The two additional bedrooms are upstairs. One has a queen-size bed and the other two full-size beds. There are also two additional full baths and a half bath. There are two TVs and DVDs; one in the living area and one in the master bedroom. There is high speed Internet hook-up available at no cost to the renter. The home has just received more than $100,000 in upgrades including new bathrooms and refinished decks. the home is beautifully appointed and very comfortable. Towels and linens are provided. You are sure to enjoy your stay at this first-class, affordable, vacation home. Plus you get two free bike rentals to use for the length of your stay. You also save 10%-50% off rental agency rates by renting directly from owner. Additional discounts from 10%-40% off listed rates may be made if there are 30 or less days until the start of the rental period. THE HARDEST THING IS DECIDING WHAT TO DO NEXT! There are canoe and bike rentals, tennis, golf, fine dining, and night clubs all located within a close proximity of the home. You are also just two minutes from Coliqney Plaza which offers several fine restaurants and numerous upscale and discount shops. Paved pathways make jogging or biking more enjoyable as well as safe. EACH RENTAL RECEIVES TWO FREE BIKES. Boat and wave rentals are available at many locations on the island. WE CAN ALSO ARRANGE A DISCOUNTED FISHING CHARTER FOR YOU WITH CAPTAIN ERIK. Wildlife refuges, dolphin cruises, horseback riding, and fishing along with countless shops, factory outlets, and restaurants are also available. Great house, great beach, great views! We are so glad that the guests enjoyed their stay and the house and would welcome them back anytime. Island getaways was very professional as well. We had one issue where the pool started to get a little cloudy and I called her and she had pool people there within two hours to fix the problem. That doesn't always happen. Never had any more issues with the pool and we used it a lot. There were a few berries from the palm trees that got on the pool deck but it was a minor issue and easy to sweep up a couple times during our stay. All kitchen supplies you could need and then some. Added bonus that there were bikes with the rental which we didn't expect. Air conditioning worked fine and kept the house quite cool. Overall this rental is a winner and I recommend it without reservation. We brought our 2 children,their spouses,and our granddaughter here for a vacation which was their Christmas gift. I wanted everything to be perfect and expense was not to be spared. Although the home has a beautiful location the house and furnishings are badly in need of repair. The outside space which is where you want to spend most of your time is in terrible shape. I literally spent 1-2hrs/day hosing down the outside patio and constantly cleaning the pool from the overgrown landscape.The outside furniture appeared to be 20yrs old,the grease from the gas drill drips down to the patio,red ants all over the patio, no water pressure in the kitchen sink and the toilet was broken in the master suite.There are about 3-4 people involved in the rental of this property which makes it hard to find the person responsible for things. Sorry for the bad review but with some upkeep this could be a beautiful property. Not fare to take people's hard earned money for such a disappointment. I heard from this guest the Sunday after she checked in and she informed me that if I did not have the pool cleaned immediately she would ruin me on the Internet. We tried to remedy this situation immediately. I contacted the pool company and was informed that the pool was cleaned on the Saturday the guest arrived but that there were a series of severe thunderstorms in HH on Saturday night and that their pool crews were out working overtime to get things cleaned up. They stated they would get to our property as soon as possible. I relayed this information back to the guest but it was dismissed as unacceptable. At that time we were not informed of any other problems. We also attempted to contact the guest a day later but she would not respond to our calls. -The grill looks like it has only been there 1-2 years. It is still in good shape. The only problem is the grease trap is very small and should be emptied after every use. It was over flowing onto the bottom of the grill. -The patio/pool furniture is very sturdy faded wood furniture. It all seemed to be in good shape, it is just dull looking. Maybe some new cushions in the chairs and lounges would make it look better. If it had a stain, it is gone. -The pool and pool deck was dirty not from overgrown landscape, but from the berries from the palm tree. They can be trimmed away, but would have to be done at least once a year. This was done. -The patio area also has some stains from the palm tree and some debris from them. It needs to be pressure washed. This was done. -The water pressure in the kitchen is fine, not slow at all. Maybe they were washing clothes, running the dishwasher or taking a shower when it did not have pressure. -The furniture in the home is dated, but it is clean, in good shape and looks good with the bedding and décor. This property is managed for the owner and involves two different groups. We have operated this way for over 10 years and have never had an issue.